Presenting the Senate Resolution declaring PA a Purple heart State is (Pictured Left to Right): Ellen Kern (Chief of Staff, Sen. Browne), Chuck Jackson (Military Order of the Purple Heart) and Bill Royer (Rep. Ryan Mackenzie’s Office). The Senate, recently, passed Senate Resolution 394 declaring August 7th as Purple Heart Day in Pennsylvania. The resolution also proclaims the Commonwealth as a Purple Heart State, joining 23 other states that have already adopted this designation. 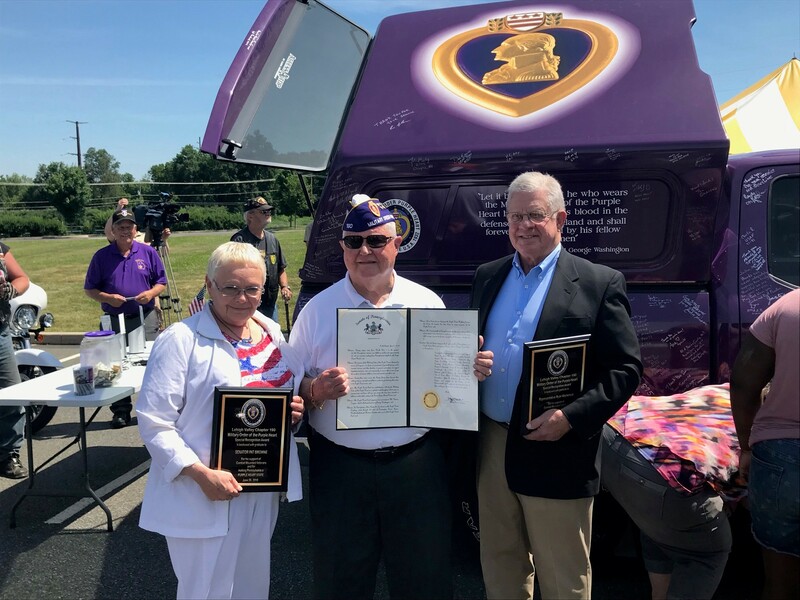 I was pleased to work with the Pennsylvania and Lehigh Valley Military Order of the Purple Heart organizations and be the prime sponsor of this resolution. During major United States wars, from World War I to the present, 32,080 Pennsylvania veterans were killed in combat and approximately 59,140 were wounded. As a symbol of their bravery and in remembrance of all they gave, those Pennsylvanians are eligible for the Purple Heart Medal. Becoming a Purple Heart state helps to honor the sacrifices of those who were awarded this distinction. The Commonwealth of Pennsylvania takes great pride in our fellow men and women who have valiantly served, and we honor the service and sacrifices of our nation’s men and women in uniform who have been wounded or killed while serving to protect the freedoms enjoyed by all Americans. Limeport Stadium in Lower Milford Township is a historical treasure second to none in our region. Hailed locally as the “original field of dreams,” the venue was constructed in 1932 by Howard “Lefty” Fegely, a well-known baseball legend in the Lehigh Valley in the early 20th century. Since its inception, the field has hosted thousands of games played by some of the biggest names in Pennsylvania Baseball. The field is still active. Approximately 100 games are played there every year. But time has taken its toll of Limeport Stadium, making it necessary to take action in order to preserve and maintain this landmark. As a result, the state of Pennsylvania awarded two $50,000 grants to provide the final funds necessary to replace the aging and dilapidated outfield lighting apparatuses, helping to ensure that Limeport Stadium will be around for the enjoyment of future generations. A.F. 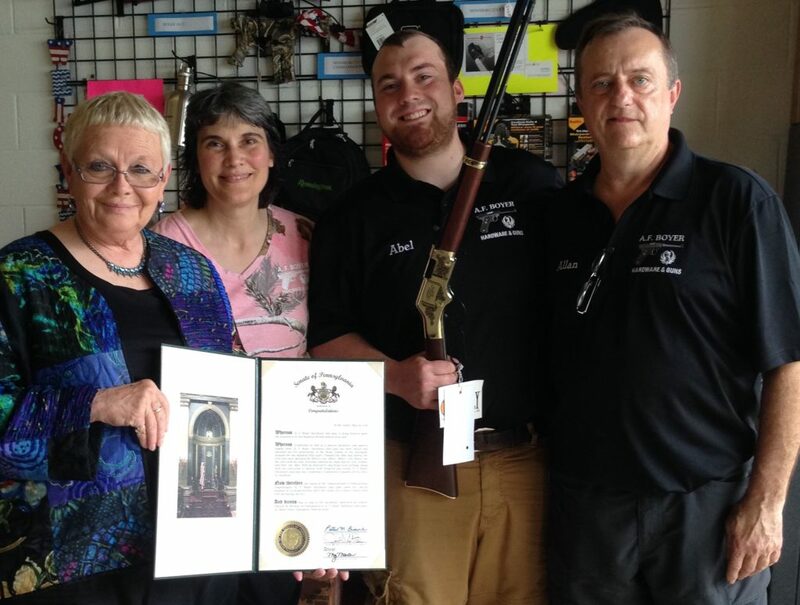 Boyer Hardware and Guns Celebrates 150 Years in Business! Ellen Kern, (Chief of Staff, Senator Browne) presenting a Senate Citation to the Boyer Family, recognizing the 150th anniversary of the family owned and operated A.F. Boyer Hardware and Guns store. A lot has changed in the Lehigh Valley over the past 150 years. One constant, however, has been A.F. Boyer Hardware and Guns in the Borough of Slatington. Recently, they celebrated their 150th anniversary, all the while being family-owned. Known for their knowledgeable and friendly service, A.F. Boyer has stood the test of time, becoming a fixture in our region. It was truly an honor to have a Senate Citation prepared to celebrate this tremendous milestone. Congratulations to the Boyer Family and all the best for another 150 years of success! The 2017 Property Tax and Rent Rebate program has been extended for eligible local residents until December 31, 2018. The program benefits Pennsylvanians age 65 and older; widows and widowers age 50 and older; and people with disabilities age 18 and older. The income limit is no more than $35,000 for homeowners and $15,000 for renters during the 2017 year. Applicants are reminded that when calculating income, only half of Social Security income is included. Applications and information are available by visiting or calling any of Senator Browne’s offices or by visiting the Property Tax and Rent Rebate section of PA Department of Revenue’s website at www.revenue.pa.gov . Claimants are reminded to bring with them and provide all the necessary income, property tax or rental information – including a rent certificate signed by their landlord – for their claims to be processed accurately and quickly. Since the Property Tax/Rent Rebate Program’s 1971 inception, older and disabled adults have received more than $6.7 billion in property tax and rent relief. The program is funded by the Pennsylvania Lottery and slots revenue. I will be holding my annual Community and Family Expo on Thursday, August 2nd from 3 p.m. to 7 p.m. at Bucky Boyle Park, North Front and Gordon Streets in Allentown. This will mark the 13th year this event has been held. It is designed to provide valuable information to parents, grandparents and children about the myriad of programs, information and other services available to them from government and community groups. As part of this year’s event, former Philadelphia Phillies All-Star second baseman, Mickey Morandini, will hold a hitting demonstration for kids. Morandini played nine seasons for the Phillies and was part of 1993 club that made it to the World Series. The hitting demonstration will start at 5 p.m. on the far baseball diamond at Bucky Boyle Park. Morandini’s appearance is courtesy of Under the Radar Sports Promotions. This is a great opportunity for kids attending the Community and Family Expo. To have a former Major League Baseball player come and talk to them about hitting and the game of baseball, is something that doesn’t happen every day.